60 MFAS Residentials Introduction by Uthman Ibrahim-Morrison from The Muslim Faculty on Vimeo. These are weekend residential courses delivered by a combination of visiting scholars and Faculty lecturers in residence who are ordinarily engaged in teaching, research or related activities. With the resources of the locality at our disposal, courses are designed to be primarily 'immersive' in character in that students are exposed to a more or less intensive timetable of teaching in the form of lectures, presentations and discussions whilst being expected to participate in the wider social and learning environment of the host community as a whole. This approach reflects the time-honoured reality that an active, organic and varied social setting provides unique opportunities for the observation, demonstration and active transmission of useful knowledge. 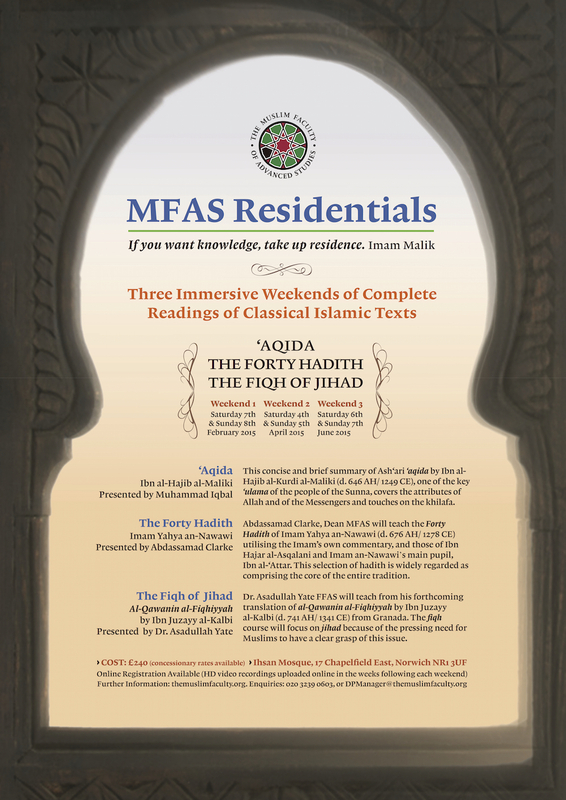 These Residentials will treat the three classical sciences of 'Aqida, Hadith and Fiqh. ‘Aqida by Ibn al-Hajib al-Maliki (1041 AH/1632 CE). Presented by Muhammad Iqbal. This concise and brief summary of Ash‘ari ‘aqida by Ibn al-Hajib al-Kurdi al-Maliki (d. 646 AH/ 1249 CE), one of the key ‘ulama of the people of the Sunna, covers the attributes of Allah and of the Messengers and touches on the khilafa. 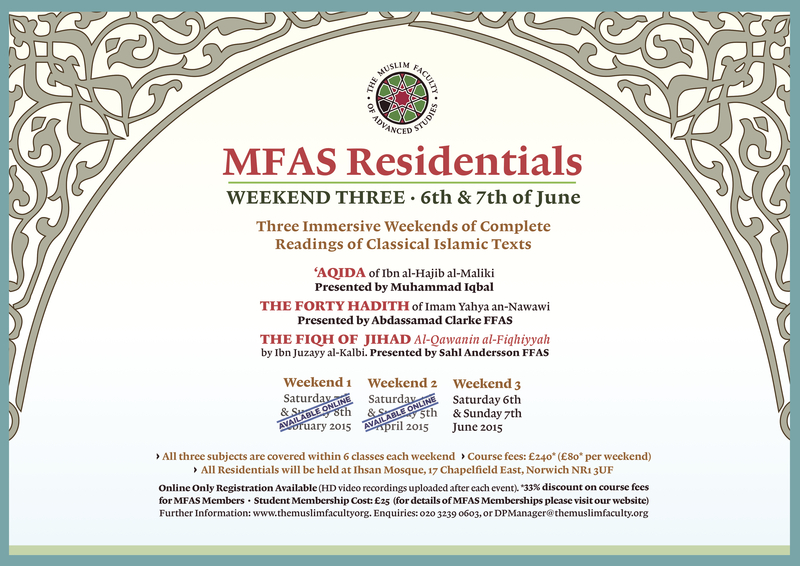 61 MFAS Residentials – ‘AQIDA • Class 1 – ‘Aqida of Ibn al-Hajib al-Maliki • Muhammad Iqbal from The Muslim Faculty on Vimeo. 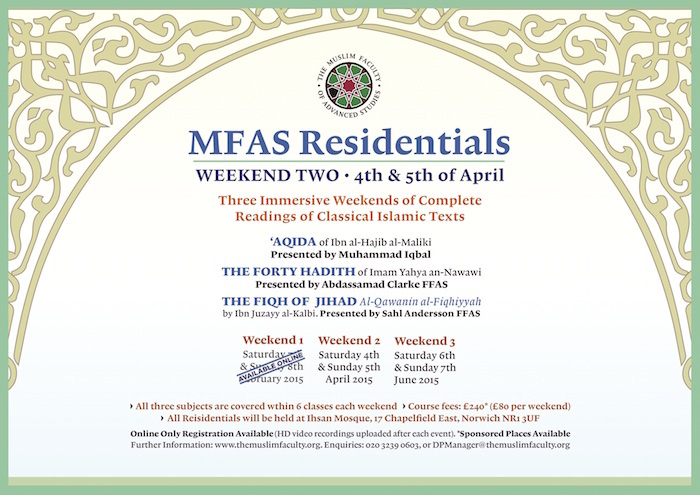 The Forty Hadith – Abdassamad Clarke, Dean MFAS will teach the Forty Hadith of Imam an-Nawawi (d. 676 AH/ 1278 CE) utilising the Imam's own commentary, and those of Ibn Hajar al-'Asqalani and Imam an-Nawawi's main pupil, Ibn al-'Attar. This selection of hadith is widely regarded as comprising the core of the entire tradition. The first lecture of the series is available here in order to provide an introduction to the MFAS Residentials and their different elements. The Fiqh of Jihad – Dr. Asadullah Yate FFAS and Director of Studies, T. S. Andersson FFAS will teach from al-Qawanin al-Fiqhiyyah by Ibn Juzayy al-Kalbi (d. 741 AH/ 1341 CE) from Granada. Dr. Yate will draw on his forthcoming translation of the same book. The fiqh course will take the narrower focus on the fiqh of jihad because of the urgent need for people to have a clear grasp of this issue. Because of the widespread misuse of the concepts of khilafah and jihad, it is vitally important for an educated person today to have a clear and mature outline of this matter from pure sources that predate the current period of confusion and re-interpretation of this material from parties interested in deriving new and previously unheard of opinions, whether 'extremist' or 'moderate'. The courses work through a classical work or a chapter of one entirely. The subjects are preceded by introductory lectures on the general nature of 'Aqidah, Hadith Studies and Fiqh.